Cortona Italy- One of my favorite Tuscan hill towns. From washing clothes in a hostel bathroom overlooking the roof tops to sitting and having a gin and tonic with my sister and some Germans in Piazza Della Repubblica. From quietly walking and exploring the streets by myself to laughing and playing in the park with my husband and children. I have so many cherished moments from this one little spot on earth, it can't help but have a special place in my heart. In the main square of the town, Piazza Della Repubblica, there is a small grocery store called Crai Market. You can get the basics and they have a bar that makes sandwiches and ready to eat items. 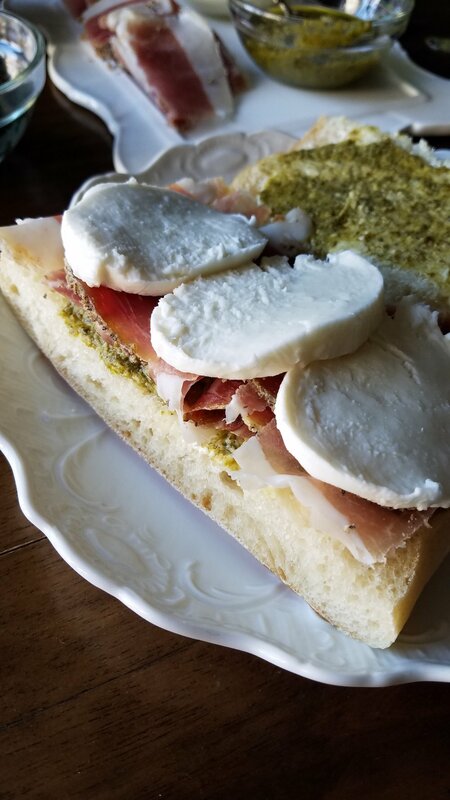 I decided to have something made here on one of my visits and this recipe is the sandwich that I put together. It is still one of the most delicious sandwiches I have ever eaten! If you ever happen to find yourself in Cortona getting something from this little market there are many lovely places you could eat at. One of them being right on the steps in Piazza Della Repubblica. If you'd like to take your picnic a little further out, here are a few of my favorites. Santa Margherita Basilica at the very top of the hill is amazing and will have you feeling like you're eating your lunch on top of the world. It is a bit of a steep walk but it's beautiful and well worth the effort. The church is one of the most unique I have seen in Italy and the view is heavenly! If you would like to take your picnic to the city park you can continue on down Via Nazionale from the Piazza. You will run right into it. I would do anything to have a park like this where I live. It's setting is like no other.....with it's trees and fountains and views.....it must be the most beautiful park in any town anywhere. If you would like a picnic spot away from it all, you can continue down the long road that runs through the park and keeps going for as long as you can see. It is a beautiful walk and eventually the road will curve around and take you behind the hill of the town. 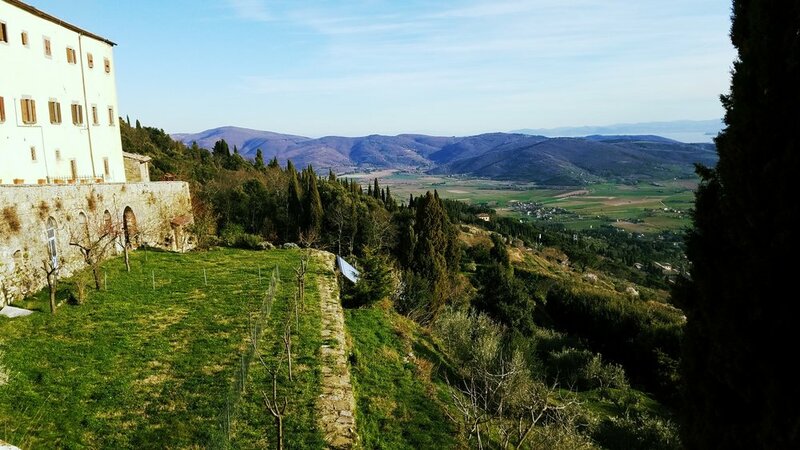 There you will find a cypress lined road with simple stone benches every so often for you to sit and enjoy a lovely lunch while looking out over the hills and valleys. It is calm and peaceful and it is as though that bench was made for you and you alone, to sit, eat and ponder away the hours. After lunch if you continue on down the road you will soon come to a beautiful Tuscan home(you will know if when you see it). It is the home of Frances Mayes who wrote Under The Tuscan Sun. It is always a good spot to do a some Italian dreaming, take a pause, and then turn around and head back to town.....for a gelato or espresso or both! The Ingredients to make your own Panino Da Cortona - The amounts can be to your liking. 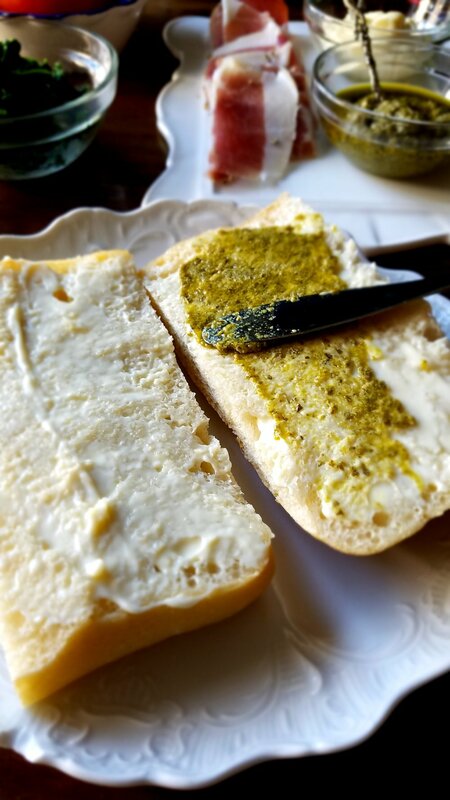 Cut the bread in half and spread a layer of mayonnaise and then a layer of pesto on each half. 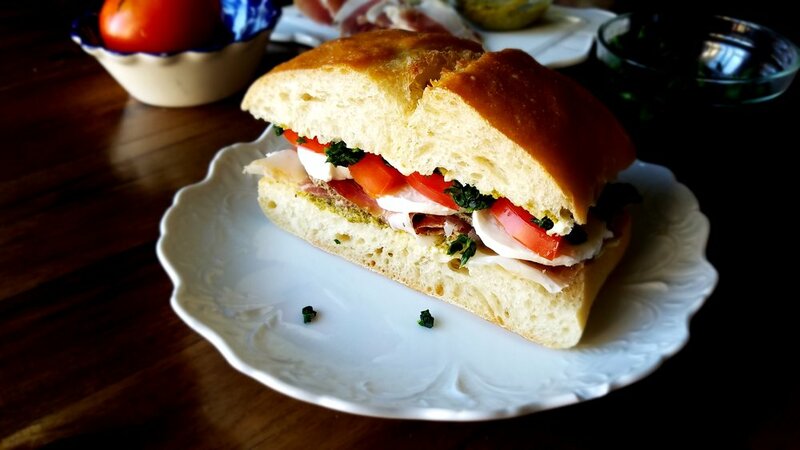 To one side of the bread add a layer of prosciutto followed by the mozzarella, sliced tomatoes and cooked spinach. Depending of how salty you like things you can always add a little salt to the cheese, tomato or spinach layer. Top with other half of bread. Mangia!